Now, in the 13th chapter of the book of Acts as you turn there, we're in a new section. There's been a transition. I just want you to know what that is. Beginning in chapter 13, to the end of the book, it has been sometimes referred to as the Acts of Paul the Apostle. Now, that's not the name of the book, of course. It's the Acts of the Apostles. Some call it the Acts of the Holy Spirit, but this section, from chapter 13 onward has been dubbed the Acts of Paul, because he becomes the dominant figure. The limelight is now off of the Jerusalem apostles like Peter, James, and the rest. And it shifts to this recently converted, within the last decade, converted rabbi. Radical Rabbi Saul of Tarsus, who will be, for the first time in this chapter, referred to as Paul. So we're watching that. Now, this is a transition that is anticipated by Jesus and, I would say, expected, in a sense, for all believers. There seems to be a natural spiritual growth that takes place. This is how natural spiritual growth at least should take place. First a person becomes a saved person, but after that, he didn't stop there. He becomes a serving person. He gets involved using gifts that he or she has been given by the Holy Spirit, discovering what they are, being fulfilled in using them in the local church. So he goes from a saved person to a saved and serving person. Then I would say he becomes a sensitized person. He's sensitive to the working of the Holy Spirit. And just what it is God is wanting he or she to do, not just in the church, but purpose in the world. Then he becomes a saturated person, filled with the Holy Spirit, but then he becomes a sent person. So you go from saved to serving to sensitized to saturated to sent out. And this is what Saul, also known as Paul, does. He has been saved. He is now serving. You will see him sensitized and saturated, filled with the Holy Spirit here. And now sent out, just in the first few verses. And he's going to go on a missionary journey, one of three journeys. He'll take four trips all together, the fourth trip will be his prison trip, where he's incarcerated and eventually killed, but this is his first sent out mission trip. So that is a natural progression. It's what Jesus anticipated when he told his men, his followers, "but you shall receive power after the Holy Spirit has come upon you. And you will be my witnesses in Jerusalem, Judea, Samaria, and the uttermost parts of the earth. Jerusalem has been saturated with the gospel," Acts chapter 5. The complaint of the enemies of the Christian church said, you have filled Jerusalem with your doctrine. So what a wonderful thing to hear. I wish we could hear today, you have filled Albuquerque with your doctrine. Amen, may that happen. But it happened in Jerusalem. And so after that, a few were sent to Judea-- Peter was. Philip was sent to Samaria. And now God has gotten a hold of Saul of Tarsus, who will become the Apostle Paul, the Apostle to the Gentiles. And he's going to go out in Gentile territory. Now interestingly, the chapter opens in Antioch and closes in a different Antioch. Now, I brought this up a couple weeks ago. I said, we're going to talk about Antioch, that's in Syria, but then there's another Antioch I tell you about later on. We're going to get to that here. So he goes from Antioch in Syria. Don't be thrown by that, there's different cities that have the same names. We went through that last time. Just like you have Cuba and Las Vegas, New Mexico, but they hardly bear any resemblance to the other Las Vegas and the other Cuba, but they're the same name. So you have an Antioch named after Antiochus, a common Seleucid name. And you have a different Antioch in Pisidia, or in what we would call southern Turkey. So it opens in one Antioch, closes in another, because Paul will be sent from the church in Antioch to Cyprus and he's going to end up in Antioch of Pisidia. That's how the flow of the chapter goes. So it says, "Now in the church that was at Antioch--" now, that is Antioch in Syria. You may be wondering why Paul and the team wasn't sent from the church in Jerusalem. It was, after all, the mother church. It's where it all started. Yes, it was-- Jerusalem was the mother church, but Antioch becomes the mission church. And that is because the persecution in Jerusalem has reached such a fever pitch. People are losing their jobs that are temple-related jobs. And so a lot of them have fled, many of them to Antioch because there's a Jewish population, an enclave, there. And so the gospel take root among them. Barnabas went there, strengthened the church, calls for Saul to come from Tarsus to Antioch of Syria. And they'll go 16 miles to the coast and they'll go on their first missionary journey. Now, we did read where it says, "Now in the church that was at Antioch." You already know what church means. We have been over this so many times. You know the Greek word ekklesia, "called-out ones," but let me just tell you that, originally, the idea of a church, even in the Greek New Testament, the original idea was a group of people. And it had at first a legal meaning, purely a legal provincial meaning. That is, it meant a group of citizens who were called out of their homes to meet in a public setting. So in Ephesus, the pagan crowd in the theater of Ephesus shouting for hours, "Great is Diana of the Ephesians," they are called an ekklesia, a church. They are called an assembly. So that's its original meaning. As time went on, it became more associated not with the legal Greek culture, but the spiritual Christian culture because people would gather together as the church, as a group of called-out people to gather together for a purpose. Now, the reason I'm bringing that up is just to refresh your hearts that a church is not a place. It's a people. And so you've heard that, you know that, but we often say, I'm going to church. No, you're actually going to a place where the church will be gathered together. This is not the church. This is, well, it's a redeemed soccer field. It's a nicely-lit Tuff Shed. It has had several purposes and now it serves the purpose of you, the church, being called out of your homes, me out of my home-- I was going to say homes, but I have a home-- and gathering together to be instructed in the word, to worship the Lord, to wait on the Lord, to be mutually edified, then to be sent out. So it's never a place. It's never a "where," it's the people who gather at that place. That's what it's all about. So back to verse one that I never finished. "Now in the church that was at Antioch--" this is Syria now-- "there were certain prophets and teachers." Quick remark-- these are the two gifts that were dominant at first. And that is partially because there was no New Testament yet. Has not been written. So you have apostles, they're like the kingpins, they send people out, but there were already people with these gifts, recognized gifts as prophets and teachers, those who would give instruction. Now, there's five altogether that are mentioned-- "Barnabas--" remember Barnabas, Son of Encouragement? First name was Joses, he was called Barnabas by the early church in Jerusalem, means Son of Encouragement. He is a Jew from Cyprus. That's where they're going to go first. Logical starting point-- he's familiar with it. Next on the list is "Simeon who is called Niger." Niger means black. It is assumed that he was a black African. Some believe that this Simeon was the Simon of Cyrene who carried the cross-- the last section-- of Jesus to Golgotha. Can't be proven. It's simply an assumption. Scholars remark on this. We can't be sure, it's possible, though. Then it says, "Lucius of Cyrene," it's also on the African continent. But look at this name, "Manaen who had been brought up with Herod the tetrarch, and Saul." Now, it's an interesting bunch. These five people mentioned in verse one, it's an interesting mix. Very diverse crowd and I love this. It shows that in the early church, there was no discrimination, no racial discrimination for those in leadership or in fellowship whatsoever. You have people with diverse backgrounds, from different places, all having this leadership role. And they're sharing that together. So there's no discrimination as far as racial boundaries are concerned. But Manaen is interesting because it says, "Who had been brought up with Saul." Now, the actual word, the wording in the verse where it says, he's been brought up with Saul-- with Herod the tetrarch. The wording is foster brother. Manaen was the foster brother, somehow related to Herod. Now, I went through all the weird Herod stuff last time, so I'm not going to repeat that, because that was just very complex and sordid, but the Herod referred to here is Herod Antipas who murdered John the Baptist and in front of whom Jesus stood trial as he was sent from Pilate to Herod and Herod back to Pilate. You know that story. It was that Herod-- Herod Antipas, the tetrarch of Galilee. So Manaen was the foster brother, grew up with Herod Antipas, the creep, but boy, did they make different decisions once they grew up. One beheaded John the Baptist. One is serving the church and is in some leadership capacity. Boy, does a choice make a difference. One choice, then another choice, then another choice, and where that road can end up. And for Manaen, it has ended up, so far, in a great place. And then finally Saul. This is Saul of Tarsus, whom we know so well. So there's five of them. Verse two, "As they ministered to the Lord and fasted, the Holy Spirit said--" how did he say it? Well, keep in mind there are prophets in the church. There are people who will speak on behalf of the Lord, giving a word of the Lord, a prophetic utterance in that assembly. "And the Holy Spirit said, 'now separate to me Barnabas and Saul.'" Notice the order-- Barnabas is first, Saul is second. That's going to change. The Holy Spirit, recognizing Barnabas, "Separate unto me Barnabas and Saul for the work to which I have called them." A couple things to notice about what the Holy Spirit said. First of all, it says they were ministering to the Lord. It doesn't say they were ministering for the Lord. Or they were ministers of the Lord, but rather, they were ministering to the Lord. The Greek word is leitourgeo. Leitourgeo is where we get the term "liturgy," or it could be translated "worship." That's the idea. Some translations-- couple of the new modern ones-- will translate it as, "they were worshipping the Lord." The Holy Spirit said this. But here, the exact wording is, "they ministered to the Lord." So leitourgeo was a word that was used of the priest when they ministered in the Tabernacle and in the temple. They would have prayers of thanksgiving. They would offer up incense. All of those were liturgical works focused on the Lord. So here is the early church worshipping, praising, ministering to the Lord. Have you ever had someone tell you, boy, what you just said ministered to me. Or, that song really ministered to me. You blessed me. I know you've had people tell you that. Well, imagine God saying that to you. Boy, you really ministered to me. You really blessed me. You think of that in terms of your worship and it will change your worship. Well, I don't feel like worshipping. It ain't about you. It's about Him. "As they ministered to the Lord." As they're focused, they're preoccupied with him-- I love this. That's what true worship is. I'll make a confession. It was several years ago and someone came up to me, visiting, after a service. Maybe I was a little tired, but not an excuse. They said, we're visiting. And just the tone of his voice-- we're visiting and we're just seeing what you have to offer. And I remember I looked at him and I should have bit my tongue, but I didn't. I said, well, we're glad you're here, but I have a question for you, what do you have to offer? It's not about what I have to offer-- we have to offer you. The church is not a commodity. It's a place where we focus and abandon ourselves on the living God. And if it's a place where you can consequentially be fed and instructed, good, but it's not about you or me. It's about Him. What do you have to offer Him, because your worship ought to be preoccupied with Him, the living God. And it was here in Antioch. They were ministering to the Lord, they were fasting. Blessing the Lord-- just think of that when you sing, when you worship, when you pray. That the Lord is going, oh, that blesses me. David said, Psalm 34, "I will bless the Lord at all times. His praise shall continually be in my mouth." So "As they ministered to the Lord and fasted, the Holy Spirit said, 'now separate to me Barnabas and Saul for the work to which I have called them. Then, having fasted and prayed and laid hands on them--" as a way of recognizing that dispatching work of God. It's simply, you are related to us. There's nothing magic in a hand. It's not like, ooh, lay your hands on me, preacher. The only thing in hands are germs, but it's an act of faith that God has laid His hand on you and we recognize and ratify what God is doing in your life. And so they laid hands on them and they sent them away. They sent them away, but the Holy Spirit was sending them away. So they were ratifying what God was doing. That's what an ordination, by the way, is. If a person gets ordained into the ministry, it's not suddenly they get a gift. An ordination is the recognition that that person already has the gift. And we're just saying, yep, amen. And so this is more of a formal ceremony, the laying on of hands, the prayer. And they sent them away. And so-- I love this-- so, "they sent them away," verse three. But look at verse 4, "So, being sent out by the Holy Spirit--" cooperation. "They went down to Seleucia," that's the seaport, 16 miles away from Antioch. So they just went from the Orontes River, that's where the town was, down to the seaport. "And from there they sailed to Cyprus. And when they arrived in Salamis, they preached the word of God in the synagogues of the Jews. They also had John Mark as their assistant." So saved, serving, sensitized, saturated, sent-- I love that progress. They're being sent out by the Holy Spirit. One of the things you discover about God is that God is a missionary God. He has and always has had missionary sensibilities. It's always been in His heart to send people places. All the way back in Genesis in chapter 11 and 12, saying to Abraham, get up and leave your country, your family, your people to a land, to a place, that I will show you. Why would God want to displace a person from their home? Well, he says that in you all the nations of the earth can be blessed. That's the purpose of missions. I'm sending you out so that people in that area, those families, can be blessed. You can carry the gospel to them and in carrying the gospel to them, they'll be blessed. In you, all the families of the earth shall be blessed. So God has always been about sending people in order to spread the blessing. When we get to the New Testament, we discover that Jesus Christ essentially was a missionary sent from heaven by the Father to the earth. And he himself gave a purpose statement-- I have come, the son of man has come to seek and to save those who are lost. He was sent on a mission, a rescue mission from heaven to earth. That's a mission. 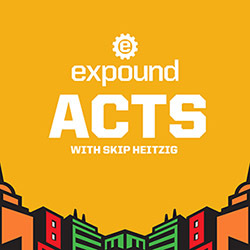 When you get to the book of Acts, you discover the Holy Spirit it's all about sending people. Sent out by the Holy Spirit, here in chapter 13. And all through the book of Acts, you see Him activating, sensitizing, and sending people in different places. Think of the followers of Jesus, the apostles. As the Father has sent me-- finish the sentence-- so I also send you. I'm sending you, just like the Father sent me. I came from heaven on a mission. You're on Earth-- I'm sending you somewhere to go spread the blessing that through you all the nations of the Earth can be blessed. So God has always been about-- and he is still here about-- sending people out, turning disciples into apostles, you might say. You know "disciple" means a follower, an adherent, a student of-- but "apostolos" is one who is sent. So God is about turning disciples into apostles. And so at some point in your life-- as you take in truth, as you assimilate scripture, as you grow, and as you learn, at some point-- if you don't get sent somewhere-- even locally in town-- to do something and to share your gifts with others, you'll become a fat, sassy believer. Spiritually obese, taking in but never exercising, being saturated but never sent, being a disciple but not an apostle. So the Holy Spirit sent them out. "From there," end of verse 4, "they went to Cyprus." Now that's logical, because Barnabas is from Cyprus. He's a Cypriot Jew. "When they arrived in Salamis, they preached the word of God in the synagogues of the Jews." Salamis was the largest commercial city on the eastern side of the island of Cyprus. It's sort of divided-- still is today-- east and west. Back then, the eastern side, which is where they ported, Salamis had the largest population, and evidently a large number of Jews who lived there, hence synagogues-- plural. So that was Paul's deal. He believed the Gospel goes first to the Jew then to the Gentiles, so he'd always begin-- and you'll see a pattern throughout the book of Acts-- starts in the synagogue, speaks to the Jews. When they want nothing to do with him, he'll share it with the Gentiles who seem eager to hear the message. So the religious folks become his enemies time and time again. Verse 6-- "Now when they had gone through the island to Paphos, they found a certain sorcerer--" now in another town-- "they found a certain sorcerer, a false prophet, a Jew who is named Bar-Jesus--" Son of Jesus-- "who was with the proconsul Sergius Paulus, an intelligent man. This man called for Barnabas and Saul and sought to hear the word of God--" proving he's so intelligent. Anybody who seeks to hear the word of God and hear the truth is an intelligent person. "But Elymas the sorcerer (for so is his name translated) withstood him, seeking to turn the proconsul away from the faith." Now I believe that part of my calling is to teach people not just the applicational truths of the Bible, but the history behind it, just so you get a fuller understanding. You see the word proconsul? That's a governor. That could be confusing to you, because we talk about Pontius Pilate being a governor. And he was a governor, but he's not given the name proconsul. He's not given the name governor or procurator, which Pontius Pilate would have been given, but proconsul. So let me tell you how it worked within the Roman government. Both a proconsul like this guy and a procurator like Pontius Pilate-- both of them governed areas. The difference is, for a procurator like Pontius Pilate, like Antonias Felix, like Porcius Festus-- names that you're familiar with from the latter portion of Acts. Those were people who were called to govern and their orders came directly from the emperor himself. Not so a proconsul. A proconsul was given his orders to govern a province by the senate, the Roman senate. So Cyprus was a senatorial province of Rome. The Roman senate gave Sergius Paulus, this smart guy, this intelligent guy, the right to govern. So that's how the Roman government was set up, that's the difference between those two. So he's intelligent-- smart guy. At the same time, he's spiritually hungry. He wants to know more. He's sort of mesmerized by this message called the Gospel. That by believing in Jesus Christ, sin can be eradicated, washed away. And you can be new before God. That was something he had never heard before, but he was interested. He was intelligent. Who better to reach an intelligent inquisitor in that kind of a culture than another intelligent man like Paul the Apostle? Paul was quite advanced in learning. And Peter will write later on, maybe even having Paul in mind, that we should always be ready to give an answer, a reason to people, for the hope that lies in us with reverence and respect. And so there is Paul, able to share with him the gospel, but there's a problem. There's a guy who's a sorcerer. Notice what he's called, "a certain sorcerer," verse 6, "a false prophet, a Jew." The reason that's unusual is Jewish people, because of the Old Testament, had an incredible aversion to sorcery. It was prohibited in their text, in their holy book. It was outlawed. That was it was capital punishment if you were a sorcerer in ancient Israel. So to find a Jewish person who is a sorcerer is quite unusual. And in fact, in reading this, it puts a question mark in my mind until I read the fuller description. It says he was a false prophet. Ah, now that helps me, because what I see him doing is mixing his religion that he grew up with, Judaism, with some of the other belief systems from different places-- maybe astrology. And so he took and he mixed up what he believed in as a Jew and what others had taught him about spirituality. And this is a form of what we call syncretism, where you combine different faiths and you make it sort of your own. It's like a smorgasbord. I want a little of this, little of that. I don't like this, but I like that. You sort of make your own deal up. Now, why is this happening? Well, at this point in history, there is a phenomenon that had occurred called the Roman road system that has essentially connected the east and the west. In the west, people are very logical in their thought processes. In the east at this time, people were very mystical in their thought processes and religion. Some of that probably filtered on those roads from the east to the west, got a hold of this Jewish guy. Goes man, I'm open. I have an open mind, I'm open to anything. See and the problem with having too open a mind, is that if it's open all the time, your brains leak out, basically. One was an intelligent man, Sergius Paulus. Not this guy-- he's so open minded his brains leaked out. Sorry to put it that way, but I'll tell you an underlying truth because it's not only 2,000 years ago in this ancient text, but it happens on every mission field I've ever been a part of. Satan uses religion to deceive people more than anything else. And religious systems become typically the enemy of most mission movements. Every missionary I've sent, when I ask them the kind of opposition, it's usually not from atheistic unbelievers as much as it is from religious groups. Even, and especially in many cases, organized churches, traditional churches. So Satan is all about deception and he uses religion and religious systems, whether it's in Ephesus, where they shouted, great is Diana of the Ephesians. Or in Athens, where they had a God on every corner and Paul even found a inscription to the unknown God. Or a syncretism like this. So one guy's very interested. The smart guy's really interested in the Gospel, but the sorcerer, the Jewish guy, the syncretist, tries to persuade him, don't listen to Paul. He's against it. It says, "seeking to turn the proconsul away from the faith. Then Saul--" now watch this, first time he's called this-- "who is also called Paul." It's the first time you read his name. And he'll go by that name from here on out and I'll tell you why in a moment. "Then Saul, who was also called Paul, filled with the Holy Spirit, looked intently at him." Now before we find out what happened, let that little phrase turn around in your heart, in your mind, for a minute. Paul, filled with the Holy Spirit. Now you're probably going to picture, yeah, filled with the Holy Spirit, he looked at him and loved on him. Because that's what people filled with the Holy Spirit always do. They just say sweet, nice, disarming things. OK, hold that thought, because he was "filled with the Holy Spirit, and he looked intently at him--" and I'm just trying to picture what that look was like. "And said, 'oh, full of deceit and all fraud you son of the devil, you enemy of all righteousness, will you not cease perverting the straight ways of the Lord? And now indeed the hand of the Lord is upon you and you shall be blind, not seeing the sun for a time.'" So before you, I want to be filled with the Holy Ghost. OK, it might look one way or another. "And immediately a dark mist fell on him and he went around seeking someone to lead him by the hand." Before I jump into that, first of all, the name Saul versus Paul. Saul was his Hebrew name. It was the name he was given on the eighth day of his life when he was a child, circumcised according to the law. That was the name he was given, Shaul. That's the name daddy called him. When dad and mom called him in for dinner, it was, Saul, come on in, supper's ready. Got the hummus on the side, got the falafels going. Come on in, Saul. But on the ninth day of his life, little Saul was given his Roman name, Paul, which means diminutive one or little guy. Now, it doesn't mean he was necessarily small, because, after all, he was given that on the ninth day of his life. So it's not like he's an adult, and say, well he's a short little guy-- because he's a baby. Now he could have been a small baby, but it wasn't an uncommon name, Paul. And in fact, Sergius Paulus, the intelligent guy, the proconsul, is named the same. So it was a common name, but that's his Roman name. One's his Hebrew name, one's his Roman name. So mom and dad are calling him Saul, but all the kids in the neighborhood are calling him Paul. That's how he grew up, with both names. Saul, who was also called Paul. And he will be referred to as Paul, by his Gentile name, because after all, he's going to be the apostle to the Gentiles. That's going to be what he traffics in mostly is getting the Gospel out to them. So here's a quick portrait of him, a composite of him. He's a Roman, legally. He's a Greek, culturally. He's a Jew, religiously. And now he's a Christian by the grace of God. He was legally a Roman because his Father had Roman citizenship. So he was called free born. He didn't have to purchase Roman citizenship. He was born a Roman citizen, so legally he's Roman. Culturally, he is Greek. He'll stand up on the areopagus in Athens and quote two Greek philosophers off the top of his head, no notes. So he's quite well read in Greek culture, Greek customs, Greek literature. He's religiously a Jew, trained rabbi at the feet of Gamaliel in Jerusalem. So interesting cat, interesting mix, interesting dude, but now born-again believer. In love with Jesus, in love with the Gospel, unafraid of people. And becomes, really, a role model for the church. I just love studying about Paul, but back to what he said and what he did. So he looks at a guy real intently. Goes, oh, you son of the devil. Whoa, question, think about it honestly. Was he harsh? Because it sounds like it. If you tried that today-- let's say I'm talking to somebody after church. And I said, you son of the devil. I'm sure the crowd listening around me would say, what's up with Heitzig? That dude is acting gnarly tonight. Did he like, eat something weird or what? I mean, that's harsh. But before you say Paul is harsh, you'd have to also say Jesus was harsh. Jesus, who overturned tables and took a cord and made a whip out of it and drove people out of the temple in Jerusalem. That's harsh. Jesus, who, in Matthew 13, time and time again said, woe to you scribes and pharisees, you hypocrites. Or like Jesus in John chapter 8 who said that you are children of the devil-- same kind of phrasing-- whose works you do. And it just happened to be the truth, because any time you deceive a person or turn a person away from the truth, that is exactly what Satan wants. Anything or anyone that tries to keep people from hearing truth can technically become an agent of Satan. So what's interesting about this guy is his name, Bar-Jesus. Means son of Jesus. Not that that had any connotation to Christianity, but it's an interesting name, that he's called the son of Jesus, but Paul calls him the son of the devil. So you can have a name that you're a Christian, but not really be one, is my point. In Revelation chapter 3, Jesus writes a little postcard to the church at Sardis. And he says something very fascinating-- you have a name that you are alive, but you are dead. He says that to a church, you have a name that you are alive, but you are dead. This guy had a good name, son of Jesus. Oh, would to God that he was a child of God. Paul said, not true. So now he says in verse 11-- and I know I'm kind of creeping through this. "And now indeed, the hand of the Lord is upon you--" not in a good way. Like boy, the hand of the Lord is upon that guy. That sounds good, but not here. It's a bad hand of the Lord upon you. "And you shall be blind, not seeing the sun for a time." Now, I wonder why Paul said that, if he decided to say that. If he could decide what the punishment will be or if the Lord said, tell him this. But why would Saul tell a man who is turning somebody away from the faith, OK, just for that, you're going to be blind for a while. Here's why, I believe-- of all people, Paul, Saul, knew the power of darkness. Meaning, on the road to Damascus, he saw the Lord, he was blinded for a few days. Couldn't see anybody, had to be led by the hand. In that blind situation, where he couldn't be distracted by anything visual, he was just sort of shut off from the world, his mind and his heart could think. And it was a powerful time. Those three days of blindness for Saul were powerful moments. He knew the power of a situation like that. So he thought-- I think it was a merciful act. And so he had to have someone lead him by the hand as well. Verse 12, "Then the proconsul believed--" bingo, pay dirt. That's the glory. "The proconsul believed when he saw what had been done, being astonished at the teaching of the Lord." He heard the teaching and he saw the effect of the miracle and the miracle equated to the teaching. So all of that together was the power of the teaching of the Lord. "Now when Paul and his party set sail from Paphos, they came to Perga in Pamphylia." Just go up, take the boat north on the Mediterranean Sea and you'll hit the southern coast of Turkey, today-- in ancient times, Pisidia. " --and went to the synagogue on the Sabbath day and he sat down." Oh, verse 13, look at this, "when Paul and his party set sail from Paphos, they came to Perga and Pamphylia and John-- that's John Mark-- departing from them, returned to Jerusalem." Now, we got to just look at this because this is going to come up again. And it's going to become a sticking point to this missionary team for a long time. John Mark, the cousin of Barnabas, is with them. He's their assistant, he was called a few verses earlier, means an under rower, somebody who would help out doing whatever. So he went from Antioch in Syria, went over to Cyprus with Uncle Barney or cousin Barney and Saul-Paul. Now they're going to another place and he decides, I'm out of here. I'm not going to continue with you and be your assistant any longer. I'm going back home to Jerusalem. The question is, why does John Mark leave them? We don't know. Don't necessarily think the worst, but we just don't know. Can I give you a couple of possibilities? Possibility number one, he was not too excited that Saul of Tarsus, now known as Paul, is sort of upstaging cousin Barney. And he is seeing a change in the leadership and he takes umbrage to it. He didn't want to support it. He's not going to be part of that. So long as Barney's in charge, he'll be part of it, but not this guy. That's a possibility. Number two possibility-- he's a Jewish believer. He's already been stretched seeing the Gospel go to Jewish/ partly Gentile people, guys like Cornelius, etc. But now just to do this whole Gentile adventure and preach the Gospel of grace without having to be Jewish or keep the law, that could have been a little too much for his Jewish sensitivities to handle. Number three-- he was sick. Maybe he got ill, didn't want to go any further, because Perga, Pamphylia, that Antioch of Pisidia that we're looking at-- was known for carrying malaria in ancient times. And in fact, Paul the Apostle does get sick, we believe, around this time on his first missionary journey. How do we know that? Well, in Galatians chapter 14, verse 13, he says, the reason I preached the Gospel to you is because I got sick when I was there. So maybe he had some sort of sickness like malaria that brought on severe headaches, eye aches-- because he talks about, you would have plucked out your own eyes and give them to me, in Galatians. So it could be that Paul was starting to already get sick. He's going into malaria territory. John Mark doesn't want to be a part of that. So he bails out. Here's another possibility-- he's homesick. He misses mom. Maybe his mom's a widow. Don't be too hard on him. His mom could have been a widow. We know that the church met in her home. We looked at that last time. So he wants to go back home and care for his widowed mother. That's a possibility because her husband isn't mentioned. Whatever the reason is though, good or bad, Paul doesn't look at it as good. Paul looks at it as really, really bad. Now, I think you need to know this, because this is going to create a rift with Barnabas and John Mark for years that will not be resolved until later on in the ministry of Paul, when he's like, on his deathbed. But if you look at verse 13, there's a simple word, it says that, "John, departing--" notice the word departing-- "from them, returned to Jerusalem." The word is apochoreo, which simply means, he left. Means nothing more than that. However, turn with me to chapter 15. So this will make sense, especially when we read through chapter 15. This is after the first missionary trip is done. They're thinking about number two. Verse 36 of chapter 15, "Then after some days, Paul said to Barney, let's go back and visit our brethren in every city where we have preached the word of the Lord and see how they are doing. Now Barnabas was determined to take with them John called Mark, but Paul insisted that they should not take with them the one who had departed from them in Pamphylia and had not gone with them to the work. And the contention became so sharp that they--" Paul and Barnabas-- "parted company from one another. And so Barnabas took Mark and sailed to Cyprus, but Paul chose Silas and departed, being commanded by the brethren to the grace of God." Now look at verse 38 and notice in that verse the word "departed." Do you see it? That's a different word. That's a Greek word, aphistemi, which means to revolt or to rebel against. It's somebody who runs away. That's the word Paul uses to describe the simple leaving of chapter 13. Paul says he's revolted, he's deserted us. So whatever it was, Paul sees it as a desertion and not following through. Whether that was a weakness on John Mark's case or on Paul's case, I'm not going to pass judgment. Just so you know that, whatever reason it was, Paul took this very personally. And it won't be resolved for quite some time. So they departed. We've covered 13 verses. Verse 14, back in Acts 13, "But when they departed from Perga and they came to Antioch in Pisidia, they went into the synagogue on the Sabbath day and sat down." This is what he does. "And after the reading of the law and the prophets, the rulers of the synagogues sent to them saying, men and brethren, if you have any word of exhortation to the people, say on." Now, this is cool. And this is why Paul went to the synagogue. There was a liturgy service in every synagogue. It began with the shema, Deuteronomy 6:4, "Hear, oh Israel, the Lord our God, the Lord is one." They declared that. [SPEAKING HEBREW] That was just part of their service, followed by, after the shema, the prayer. After the prayer, the reading of the law and the haftorah, as they call it-- different portions of scripture. They would have the reading. Followed by a section where it would be commented on either by the leader in the synagogue and then a visiting rabbi or just a visiting rabbi. Paul was a visiting rabbi. Paul, come on up here, man, share with us an encouraging word from the Lord. OK, so why is this cool? Because we have now the first recorded, written-down sermon of Paul the Apostle. And it's big, I mean, the whole thing's written down, presumably. So if you wanted to study the preaching of Paul, study this sermon, because it's him preaching the Gospel. And it can even be outlined. I've looked at it and I can see the breakdown of it. I could actually outline it. I don't want to presume to give Paul an outline, but I see an outline here. Where he begins by talking about the anticipation of the messiah in Jewish history, followed by the action of the messiah in coming, in dying, in rising. Followed by the application and appeal to the crowd. It's a very easy format, kind of a one, two, three punch. Maybe a one, two, three, four punch, but it's cool because it's his first recorded sermon. And it seems to be in totality. So with that, let's see how we do. Verse 16, "Paul stood up, motioned with his hand. Said, 'men of Israel and you who fear God--" that is, Gentiles, God-fearers who haven't fully converted. Listen, he says, "the God of this people Israel chose our fathers and exalted the people when they dwelt as strangers in the land of Egypt. And with an uplifted arm, He brought them out of it. Now for a time of about 450 years, He put up with their ways in the wilderness. And when He had destroyed seven nations in the land of Canaan, He distributed their land to them by allotment. After that, He gave them judges for about 450 years, until Samuel the prophet." Now by the way, when he talks about 450 years, he is counting 400 years in Egypt, 40 years in the wilderness, 10 years conquering and settling the land to the time of the judges. And afterward they asked for a King. So God gave them Saul--" whom he was named after, by the way, since he is of that tribe. "The son of Kish, a man of the tribe of Benjamin--" Saul of Tarsus was also a Benjamite. "For 40 years. And when He had removed him, He raised up for them David as king, to whom also He gave testimony and said, I have found David the son of Jesse, a man after my own heart who will do all my will. From this man's seed, according to the promise, God raised up for Israel a savior-- Jesus-- after John first preached before his coming the baptism of repentance to all the people of Israel. And John was finishing his course he said, who do you think I am? I am not He, but behold, there comes one after me the sandals of whose feet I am not worthy to loose." So that's the first part of his sermon, the anticipation for the messiah. Now what Paul does here, you should know, was something the Jews were fond of hearing. It's called historical retrospection. They would often rehearse their own history to other Jews. Psalm 107 is a great example. There's a couple psalms that do that-- I think Psalm 97, Psalm 94, and Psalm 107. But anyway, so they talk about their history. Why? To encourage them-- God worked in the past, God's going to work in the present, God's going to work in the future. They would always tell their story from one generation to the next. He's employing that. By the way, Stephen did the same thing, chapter 7. When he preached, he went through a whole litany of their history, more detailed even than he does. Verse 26, "Men and brethren, sons of the family of Abraham, and those among you who fear God, to you the word of salvation has been sent. For those who dwell in Jerusalem and their rulers, because they did not know Him nor even the voices of the prophets which are read every Sabbath, have fulfilled them in condemning Him." His second point is the action of the messiah. This is what Jesus did, this is how He was received, and this is how He was treated by people who read the Bible. He was maltreated and killed by Bible students. So he's trying to get their attention. I think he's quite successful at it. You meet here every week in the synagogue and you read the scriptures. So did the people in Jerusalem, but they killed the very one the prophets spoke about. So you can have a full head and an empty heart. Jesus said, you search the scriptures, for in them you think that you have eternal life, but these are they which testify of Me. So he's saying they ignored that testimony. Verse 28, "And though they found no cause for death in Him, they asked Pilate that He should be put to death. And when they fulfilled all that was written concerning Him, they took Him down from the tree and laid Him in a tomb. But God raised Him from the dead." Now, in New Testament preaching, in the sermons in the book of Acts, this is the common thread of all New Testament, biblical preaching-- by Peter, by Paul, by all, by y'all, by 'em all. The Resurrection is the capstone and the arch of Christianity-- remove it, the whole thing collapses. You have a dead savior, does no one any good. The Resurrection is a necessity for there to be any victory over sin and death and promise for eternal life. So it's always central to, "but God raised Him from the dead." Atoning death, Resurrection-- that's the Gospel-- part of the Gospel. And according to Paul, it is the validity that the redemption found in the death of Jesus Christ is real. If somebody dies-- oh, he died and because he died, we're saved. Well, you could say that about anybody, but the guy that rises from the dead? He gets the A on the test, right? He's the one. "But God raised Him from the dead. He was seen for many days by those who came with Him from Galilee to Jerusalem who are His witnesses to the people. And we declare to you glad tidings--" Gospel-- "that promise which was made to the fathers. God has fulfilled for us their children, in that He has raised up Jesus. As it is also written in the second Psalm, 'you are my son, today I have gotten you.' And that He raised Him from the dead no more to return to corruption. He has spoken thus, 'I will give you the sure mercies of David.' Therefore He also says in another Psalm, 'you will not allow your Holy One to see corruption.'" So he's quoting lots of scripture. And again, he's just standing up because he was asked. He's probably collecting thoughts because he knows the custom in the synagogue, but he's fired up. He's ready to go. And it's saturated with scripture. If you want God to use you, know much of the Bible as you possibly can. Then God has something to work with. And you'll be in a situation, in line at Starbucks, on a construction site, in the OR at the hospital, and God can use you to speak into the lives of people the truth of God because it's part of your life. "For David, after he had served his own generation by the will of God, fell asleep--" that is, he died, kicked the bucket. "But was buried with his fathers and he saw corruption; but He whom God raised up saw no corruption. Therefore let it be known to you, brethren, that through this man is preached to you the forgiveness of sins. And by Him everyone who believes is justified from all things which you could not be justified by the law of Moses. Beware therefore, lest what has been spoken in the prophets come upon you-- 'behold, you despisers, marvel and perish! I will work a work in your days, a work which you will by no means believe, though one were to declare it to you." There's a little too much for me to really do justice to that, so I'm going to save that for next time. But Paul, being an intelligent man, brings up a very important issue because it would become a concern. It would become a accusation. And that is, if you go back, in verse 31, Jesus was seen for many days by those who came up with Him from Galilee to Jerusalem who are His witnesses to the people. Now he addresses a very important issue. It will become an issue, especially in psychiatric circles in years to come. When people will say as an explanation for the Resurrection, Jesus never rose from the dead, people had hallucinations that he rose from the dead. And I don't know if you've spent much time with people in the mental health world, but I know people have seen a lot of things. I saw a lot of things for different reasons in my before-Christ days, usually hallucinogenic drugs. But I saw things and they were hallucinations. People have seen, for a number of reasons, hallucinations. People say, these people just saw hallucinations, that explains the Resurrection. It does not, because any psychiatrist worth his or her salt will tell you that hallucinations happen under certain cases to certain types of people, usually who are very imaginative and high strung for a number of reasons. And I told you my own reasons. But one of the things hallucinations don't do is happen the same way to a whole bunch of differently disposed people. So you have Thomas, a doubter. You have Peter, who's astonished. You have Mary at the tomb weeping and other women who are weeping. You have the road to Emmaus disciples who are down and discouraged. To all different emotional states, Jesus appears to them. Not only that, 1 Corinthians will tell us that Jesus appeared to 500 people at one time. And any mental health expert will tell you, a group of people don't get a hallucination. If 500 people at one time see the same thing, something happened. That's an event, not a hallucination. So when he's talking about the Resurrection, it's as if he's anticipating what some will have as a false explanation for the Resurrection. It can't be a hallucination. It is a Resurrection. Jesus is alive right now. And the best part is yet to come. So we'll wait till next time. Father, thank you that we could spend this time in part of this chapter. And just explore this incredible transition of Saul, Rabbi Saul to the Apostle Paul. One who was of notoriety as Saul, but one who became small, humble. And saw himself as the least of all the saints, one whom you powerfully use and spoke to and spoke through. Lord, I pray that that progress would be a part of our Christian experience, that we who are saved would be those who are serving. And those of us who are serving, we wouldn't do it in the energy of our own flesh, but we'd be sensitized to what gifts we have and saturated by your Holy Spirit and sent next door, next city, state, across the world. For your glory, that the Gospel will go through Jerusalem, Judea, Samaria, and to the uttermost parts of the earth. May we, by our testimony and witness, fill this city with your doctrine in Jesus' name, amen.